€ 50.00 Euro Price By David Irving. Using diaries and official and unofficial records never published before, this second volume of ‘Churchill’s War’ takes a close-quarters look at the middle years of the Second World War. 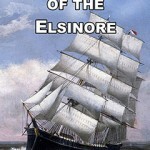 Volume I chronicled a chain of disasters through the fall of France to the debacle in Greece; this second volume chronicles great naval victories, El Alamein and the landings in North Africa. The book contract was signed with a London publisher in 1972. 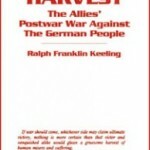 Volume I (publ. 1987) attracted critical acclaim, sold 20,000 copies, and was widely translated. Major publishers in the UK and USA issued editions. Volume II appears 14 years later after an uneasy birth. During the 30 years of its writing the world has turned; the halls of historical research now tremble to the tread of political correctness. This work’s author finds himself no longer the celebrated subject of reviewers. Major publishers who still aspire to print his works come under assault from international bodies. In July 1992 – even as he was returning from the KGB archives in Moscow with the secret Goebbels Diaries – the directors of Macmillan Ltd. were being forced to the secret decision to burn all stocks of his remaining works. This work benefits however from the release of thousands of secret files. At the author’s request both the John Major and Tony Blair governments opened files previously sealed: thus we know more about Anthony Eden’s role in the murder of Admiral Darlan. The human side of Winston Churchill reaches boldly out of these pages – lively, incorrigible, and sometimes callous; hectoring his ministers, but meek and subservient to Moscow and Washington. 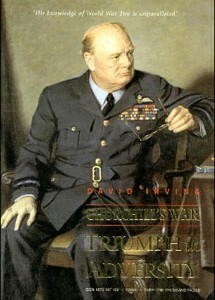 The picture of him that emerges in Real History is sometimes unpalatable – willingly fomenting and prolonging the war against Hitler, not in pursuit of any fundamental British interest but to acquire, consolidate, and enjoy power and its fruits after years spent in the political wilderness and relative poverty; he appears undismayed by the ruin of the British empire. 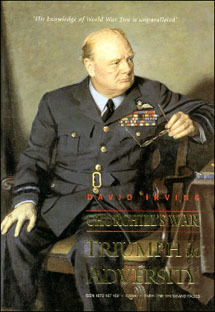 In two appendices Mr. Irving reveals that Roosevelt and Churchill maintained top secret communications channels to exchange messages that are still not released to the public. Hardbound, 40 pages of black and white and color plates, 1072 pages.